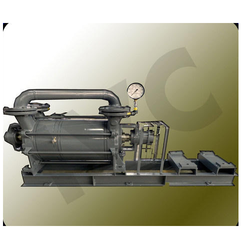 Our range of products include vacuum pump for distillation application. Two Stage Vacuum Pump for Distillation Application are better designed than single stage vacuum pump, having advantage of higher capacity at High Vacuum and also requires low quantity of water at low Pressure compared to single stage vacuum pump. The pump can be provided with closed loop liquid operation, automatic control and with other required features. There are no Teflon balls inside the pump to deteriorate vacuum performance compared to single stage vacuum pump. Looking for Vacuum Pump for Distillation Application ?